The winner will have the opportunity to compete in the World Cup competition in England to implement a community oriented project. ENACTUS Egypt Foundation for Developmental Projects is organizing a competition sponsored by Orange Egyot during the period from 9-10 July, with 40 Egyptian universities competing for first place in the competition. The winner of the local competition will have the opportunity to compete in the World Cup competition in England, set to help creative students turn their ideas into projects that help develop the community, the environment or economic aspects. These projects aim to empower community members and spread the idea of entrepreneurship to raise the standard of living and quality of life of members of the society. Through the competition, the competing university students will submit the results of these projects to a select panel of businessmen to choose the most influential team in raising the standards of the community. This team will represent Egypt in the World Cup. On the occasion, Sherif Hanna, Vice President of Human Resources and Internal Control in Orange Egypt said, "Orange's sponsorship of this competition is under the umbrella of the Orange Egypt Youth Foundation and comes from a belief in the developmental role played by the Egyptian youth and providing new opportunities for the youth to raise their skills and improve their experience to build a better future for the country. Orange continues to increase its investments in Egypt and considers the investment in minds, ideas and more developed human cadres the best investment to be made." He added, "The Company also helped encourage students by filming their projects in the most beautiful part of Egypt, namely Aswan, in preparation for the final competition. 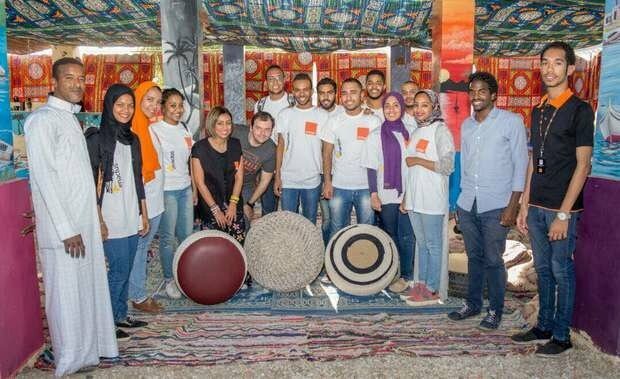 We also organized a meeting between 15 students and Nubian beneficiaries participating in the two main projects (tire recycling and bamboo planting)."